Management theory is full of good advice, but how should it be put into practice? How can we harness the lessons gleaned from across government and adapt them to the delivery of a specific service? I’ve applied the principles set out in our good practice guide, Managing business operations, to child protection services. Drawing on our recent report, I’ve looked at what’s happening in practice, where there’s good practice be shared and how the centre is taking a lead. Using our identified four characteristics of success, I’ve set out questions professionals should be asking themselves to help improve services. Child protection services have been in the spotlight for decades, and several programmes have aimed to achieve that highest of all priorities – keeping vulnerable children safe. But despite the Department for Education’s (DfE’s) implementation of most of the recommendations for major reform of children’s social work set out in the Munro Review of child protection, child protection services still occasionally fail. The whole system is showing the symptoms of poor operations management, locally and nationally, as highlighted in our recent report, Children in need of help or protection – which includes an ‘easy read’ version. From our work across government, we look at what has and hasn’t worked in delivering public services. 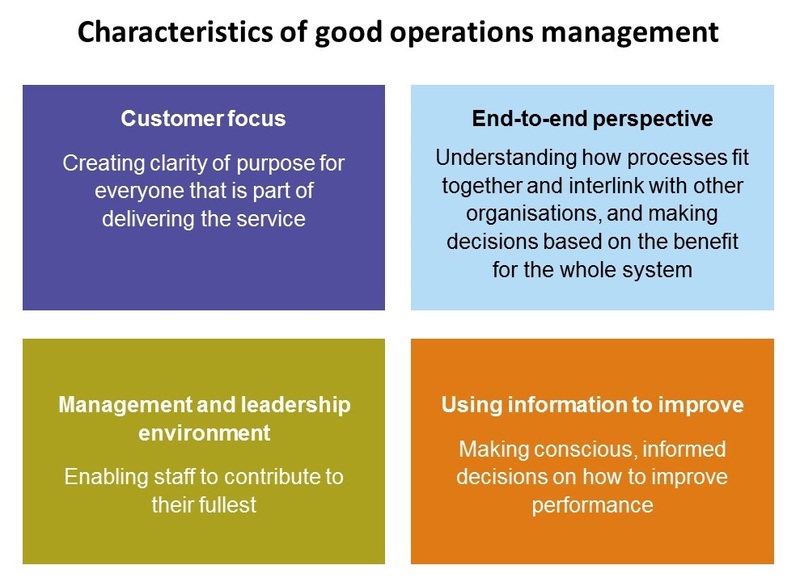 The head of our Operations and Process Management group, Alec Steel, has blogged about these four characteristics (right) of good operations management in Improving services for citizens and about an effective management system in The glue to managing change. The characteristics of success may sound obvious; but how can they be applied to child protection services? In 2016 we visited eight local authorities; half judged ‘Good’ by Ofsted, half judged ‘Inadequate’ and in need of help from DfE to improve. We asked councillors, managers and social workers to describe how well the child protection worked in their locality and about the challenges they faced. Based on this work, I’ve looked at how the characteristics of good operations management can be applied to improve the way child protection services work for children and families and efficiency of the system as a whole. Operations management theory: A strong customer focus creates clarity of purpose for everyone in the organisation. The issues: Here the child is the ‘customer’, whose needs must be paramount. Statutory guidance says that child protection services should be based on a clear understanding of the needs and views of children. But children and young people say they are not always listened to, seen often enough by professionals, nor asked for their views. Child protection teams rely heavily on other professionals – particularly the police, health and education – to do their bit to keep children safe. These partners are secondary customers of the local authority, but they may have conflicting priorities. Partners need child protection teams to confirm that they were right to be concerned, and advise what they can do themselves to help the child. These actions help get the right help to vulnerable children at the right time. Local authorities do not always tell partners, especially in schools and the police, what has happened about their referral. Some partners, often GPs, may not tell local authorities about children at risk because of data protection concerns. Children do not always get the right help at the right time, because partners ignore agreed thresholds, leading to inappropriate, or no, referral. This can leave children being left at risk of harm. Good practice locally: The best local authorities seek out and experiment with methods of collecting children’s views. We heard of authorities that, wherever possible, invited children and families, or their advocates, to attend and contribute to child protection conferences. Others use mobile apps to gather children’s views on services, or have formal meetings e.g. Islington’s Children’s Active Involvement Service. 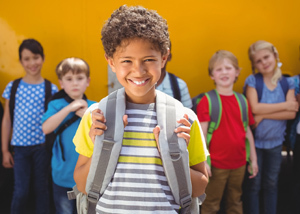 Central measures: Nationally, Ofsted put more focus on the child’s experience and outcomes when it introduced the Single Inspection Framework for local authorities’ children’s services in 2013. Ofsted inspections also shine a spotlight on the experiences and progress of children who need help or protection. Ofsted is consulting on a new framework. It has proposed that service quality will be judged, in part, on how well local authorities understand and take into account children’s views. Does the child protection process put in place the practical help children need? Do children’s services and partners understand what children want and need, and when their needs change? Can your organisation adapt its processes if demand for services changes significantly? Do different bits of the child protection system flow smoothly for children, end-to-end? NAO resources: We have written guides for children and young people to tell them what we found and what government has said it will do to make services better; these include our report on children and young people in care and leaving care and (to be published mid-January) Children in need of help or protection. We’ve also blogged specifically about the state of services for children in care and what do central and local governments need to do, see Good services: child’s play?, and about care leavers and how to improve services for them, Care leavers: engaging for solutions. Operations management theory: Effective management and leadership allows staff to contribute to their fullest. That means creating an environment where people and teams can learn from experiences – good and bad. Then services improve and become responsive to customers’ needs. Ofsted has judged the quality of leadership, management and governance of children’s services to be ‘Good’ or ‘Outstanding’ in only 31% of authorities. The department says that improving this nationally is a high priority. We found that social workers and other professionals do not always find it easy to find out what works. Good practice locally: Locally, we found some examples of sharing of good practice, such as regional benchmarking clubs and peer review arrangements. Central measures: Nationally, the child protection system is bad at learning from good practice and mistakes, and the blame culture does not help. The department recognises this, and is drawing up plans to spread and embed good practice. It has promised a “What works centre” and has invested in an Innovation Programme to try to identify good practice. Are staff given the support and time they need to learn what works? Are they allowed to improve the process? Is the environment right for continuous improvement? Operations management theory: Looking at services end-to-end helps organisations avoid decisions that have a negative, knock-on effect down the line. Working on different computer systems without access to each other’s databases. Partners have the time-consuming job of manually cutting and pasting information from their own databases into a template. And the risk data are incomplete. Lacking a common understanding or application of thresholds for assessment; a point also made by some ‘serious case reviews’. If partners don’t all accept the agreed thresholds then the result will be inappropriate referrals or children left at risk. Partners aren’t always providing timely information or attending meetings and conferences. For example, during one inspection Ofsted found 36 cases of concern referred together in one batch from a hospital to a local authority. 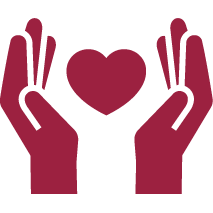 Local Safeguarding Children’s Boards (LSBCs) have the job of developing local safeguarding policy and procedures and scrutinising local arrangements. Many LSCB’s cannot set clear procedures or make sure local services are good. According to Ofsted, 78% either ‘Require Improvement’ or are ‘Inadequate’. Central measures: The government has introduced the Children and Social Work Bill to improve the way LSCBs, councils and partners work together. Are all professionals focusing on the child’s needs, even when different organisations provide different bits parts of the service? Who is responsible for making sure the different bits of the system work together seamlessly? Do they have the clout to sort out any problem quickly? 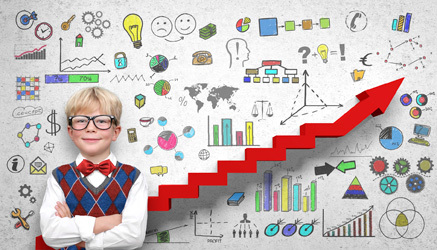 Is your performance data measuring what is really happening for children throughout the process? Operations management theory: Professionals at all levels of the organisation need relevant data on how services are working. But collecting data is not enough. Professionals should consciously base decisions about how to improve services on sound data. The issues: Local councils and national departments equally need to base decisions on accurate data. But knowing and measuring what is important about a child protection service – how well each action contributes to protecting children – is tricky. Local authorities count the number of referrals but not the number of contacts. This means they underestimate the amount of work their teams are tackling. Every time the child protection team gets a call about a child, it must respond, if only to direct the caller to other services. Local authorities record the risks when assessing if children need help or protection. But when they close a case, they do not record whether or how well managed those risks were. Rates of referral and re-referral within a year can be seven to eight times higher in one locality than another. There may be good reasons for different levels of referral. There may be good reasons why children need to be re-referred, too. But such wide variations should provoke more questions about what is going on locally. There’s little information showing that help given to the child and their family has made a positive difference in the long run. Poor records meaning gaps in data available to senior managers, according to Ofsted. It also found leaders and managers of ‘Inadequate’ local authorities did not grasp performance and management information to challenge staff or decide which problems to tackle first. The department’s information on the quality of child protection services for one-third of local authorities is at least three years old. It only intervenes when Ofsted has already found services have left children at risk of harm. We think its interventions to improve failed local services for children are neither risk-based nor early enough. Are your measures of service the right ones? Do they tell you how well you are doing at keeping children safe? Process information (e.g. time taken) are useful, but do you also capture the quality of services? Are all staff in your organisation using information to decide what needs doing and how? Do your indicators include the child’s and local authority partner’s satisfaction with the service they are getting? What do you know about each intervention’s long-term impact on children? All parts of government are struggling with such questions about their operations: DfE and child protection services are not alone. Many local authorities are facing challenges to improve services, despite increasing demand and tight budgets. DfE’s vision is that all vulnerable children, no matter where they live, will receive the same quality care and support by 2020. It is a long way to travel in four years. By asking the right questions about how child protection services work and are managed, local and national partners could contribute to making this ambition a reality. I’d welcome your comments and invite you to contact us if you would like to discuss child protection or operations management more generally. About the author: Sarah Perryman is a Senior Analyst in the NAO’s Education value for money team and has worked on a wide range of local government and education studies. Sarah worked at the Institute for Employment Studies before joining the NAO in 2004.